Tater Tots For The Masses: Just Retire Already! I am a HUGE Vikings fan...representin' my home state, yo! 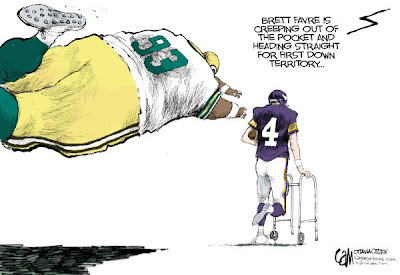 I really don't mind Favre coming our way, mainly because I know a few Pack fans that are REALLY pissed off about it. Back off YO! Yo hosers have Al Franken for Senator too. I may have to drive over there and hide your straws if you are going to be all up in my shinizzle.